Truly a timeless pair of tracks in this release - not only did they help shape the early Daft Punk sound, but in-ten-cities has got to be one of the most underrated B side releases. What a release - and to think it came out in '93..
Richie Hawtin's mix is a seminal classic. Stripped down funky mayhem. Sneak and Carter both caning that mix back in the day. And Carter had his own mix on the EP! Tells you something. One of my favorites. All mixes...got this when I just started djing, was always with me in those days of milk crates. It still goes everywhere. The original is a sure kick start to a dead dance floor. 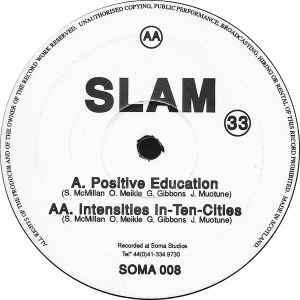 Positive Education is brilliant but Intensities in Ten Cities is much better if that's even possible.. Probably the strongest, most epic set opener in the history of house music. Trust Richie Hawtin and his whopper haircut to ruin a perfectly good track. Nob off, minimal. You were a fart in the wind. Good riddance. Listening back to this, apart from the original which needs no further props, the Derrick Carter mixes are fantastic. They still sound like the future now! I am very curious the sample/influence of Intensities In-Ten-Cities, If or how much the movie Boyz n the Hood (1991), particularly Ricky's revenge scene towards the end, influenced this. The movie came out in 1991, and the similarities are very strong... works amazingly in this track, great to see cross-cultural influences if it is indeed inspired by this. Not bad, just unimaginative plodding 4/4 techno floor filler - no real hi-tech funk to be found here. Greatest techno record ever. Already is such a banger, the fact that this released as early as 1993 takes it to another level. Very futuristic, deep, and addictive sound.